I’m starting to understand how that mentality comes about. Poor kitten, I will take just this one and care for it. Thirty nine "poor" cats later, the neighbors refer to you as the crazy cat lady…. So I’m thinking I suffer from the same thing. Last week I was posting flyers advertising my air pistol league at all the local sporting good shops. I hear this faint yelping. Way down in the bottom of the display case. An un-loved Model 10 smith . The 4” pinned bull barrel model. This poor thing had a spattering of surface rust and some crude holes drilled in the top strap for a scope mount. Bluing had long ago rubbed away on either side of the barrel. Evidence of spending a long time in a holster as a faithful duty piece. I was the responsible good guy, petted it a few times then put it back. Price was reasonable but I don’t need another revolver. That should have been the end of it but I kept seeing those sad puppy eyes. How the previous owner had abused it and it needed to get free of this horrible confinement. Karma convinced me I should give this old girl a new home because I have an un-opened Wolf spring kit in my box-o-parts. I went back with a pocket full of cash and a low ball offer. He saw in my eyes I couldn’t stand to see the old girl in that cold display case so didn’t budge much on the low ball offer. I ended up getting out the door for just under $250. It came with the weaver mount that some gun plumber attempted to install. Had 3 and a half holes drilled in the top strap. Two of them still had some threads. None were on the same center line. The bottom of the mount was not “fit” to the revolver, sort of filed so it would kind of fit. I installed the screws with blue lock-tite (finding only the two good holes) Mounted a 1” ultra Dot and let it set up overnight. Took some target ammo out to the range and sighted it in. What a nice old revolver. Put 10 shots in the 10 ring of a T/R 50ft target. 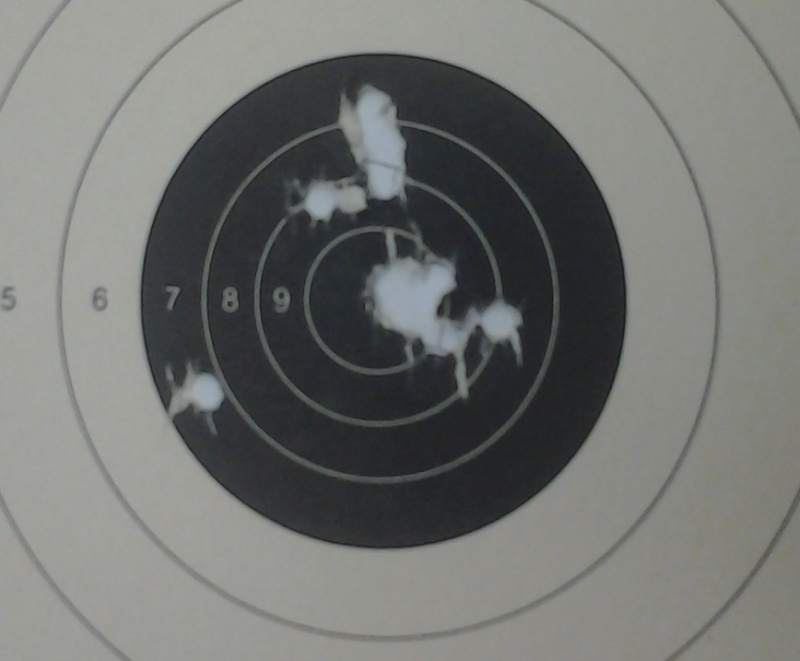 Then the shot groups started opening up. Sure enough two screws were not enough to hold the mount. Brought it home, rubbed it down with some oiled extra fine steel wool. That took care of the spattering of rust. Going to try it using the fixed sights in our local league tonight. Nice that it got rubbed down, oiled and cleaned up. I’ll post the results from the league and let you know how she did. In the meantime, Look around in Your “box-0-parts” and see if there is an unused AimTech mount that bolts to the side of K frame Smiths. I’m looking for one. Good old model 10s. I carried one as you described in the academy and I was able to outscore everyone except the range master and his custom PPC gun. I wouldn't mind having one of those with the three inch barrel even now. "I’m starting to understand how that mentality comes about. Poor kitten, I will take just this one and care for it. Thirty nine "poor" cats later, the neighbors refer to you as the crazy cat lady…." With guns as with cats, the trick is to never let them in the door. Or as my father used to say...never invest in anything that eats or needs paint. Schaumannk wrote: Or as my father used to say...never invest in anything that eats or needs paint. I had one of those AimTech mounts ad wasn't too happy with it. It kept loosening up under the violent recoil of 2.7gr BE. The last thing I was going to do was loctite the sideplate screws to keep it tight. Actually, I may still have it somewhere. I got out of work early about two weeks ago and decided to check the used counters at some local stores, more for entertainment than anything else. A black rifle shop had a 1980's S&W Model 41 for less than gunbroker prices. It looked kind of lonely there. While doing errands recently I decided to see how it was doing. Lo and behold, they now had a 1972 Model 52-2 and a different Model 41 from 1978. Left the store going "wow that would be fun to try", then turned around and bought the 52-2. It had been put away dirty twenty years ago, but cleaned up well with no pitting. The next day I went back to get the Model 41 to make a set, keep it company. One day I went in my local gun shop and the salesman, knowing me too well, said "you need to see this.." He pulled out a K frame Smith, which had obviously spent too much time stored in a holster. But it was just fine surface rust and I was looking for a project gun. And it was a Model 15, so I thought. As I took it in my hand to look at it, I noticed the fourth screw on the side plate! Really, I thought. A few moments later I spied the fifth screw on the front of the frame! Now, I didn't need another safe queen, and there was no way I would start replacing parts and drilling and tapping on this old girl. But I couldn't just leave her there and let her end up in a bad home. . .
What is a good red dot rail for a Model 10? A poor M64-3 4" with a very nice action followed me home recently. I'd like to see what it can do. I love the model 10s!!! They really are just a stone basic firearm that just never quits.